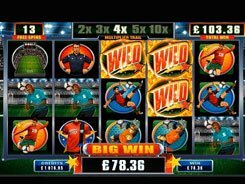 To celebrate the 2014 World Cup in Brazil, Microgaming has released the stunning slot that transports you to a stadium packed with cheering and chanting fans. 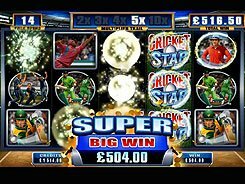 Football Star is a five reel slot based on a 243 ways to win system, so there is no need to create paylines since winning combos are awarded for getting three or more matching symbols on adjacent reels. 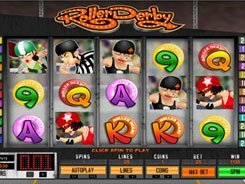 The game accepts a bet in a range of $0.5 to $50 per spin, with a coin value configured between $0.01 and $0.1. 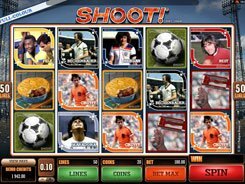 The slot’s fixed jackpot of 5000 coins is paid out for five scatters (the football on fire) landed in any position. 3+ scatters trigger up to 25 free games with the Rolling Reels active at this time. 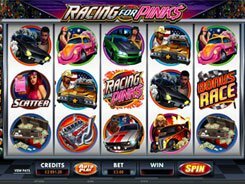 In a normal game, the Striking Wild feature randomly activates making reels 2, 3 or 4 all wild for a guaranteed cash award. Furthermore, a wild symbol represented by the Football Star’s logo comes stacked at times, so a wild can cover two or even three symbol positions on a reel. The spectacular slot incorporates everything you would see at a real stadium (strikers, referees, goalkeepers...) creating a sense of full immersion into the game.